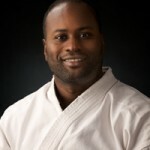 Collin began his study of Aikido as a student of Obata Shihan in 1997 at JCCC Aikikai and has received extensive knowledge in both the technique and spirit of Aikido. In 2003 he traveled to Japan where he furthered his studies. Collin believes “Aikido is the perfect practice in timing and movement, and no matter where you are in life time is passing and energy is moving”.